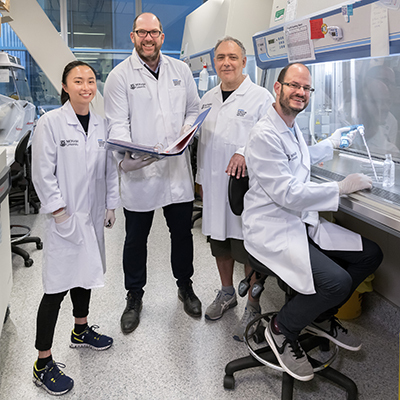 Monash University’s Biomedicine Discovery Institute scientists have defined a novel molecular ‘blueprint’ that plays a pivotal part in the immune system’s ability to fight disease by ‘remembering’ infections. Understanding the fine detail of immunological memory potentially opens ways to improve, and to create new vaccines, and to hone treatments that use the immune system to fight disease including cancer. During a response to infection the immune system’s B and T cells create memory cells, allowing it to develop immunity to future infections and also to gain protection through vaccines, which serve to mimic the sort of immunity induced by the virus or bacteria the vaccine is trying to prevent. The study, led by Professor Stephen Turner, used the influenza virus to investigate how cytotoxic or killer T cells – the ‘hit men’ for fighting infection – are genetically wired to behave. The gene regulatory mechanisms that control the changes that occur in T cells during infection were previously largely unknown. The study, which used cutting-edge gene sequencing techniques in animal models of influenza, was published today in the journal ‘Cell Reports’. The same mechanisms engaging T cells that are used to fight infection are used to fight cancer and in immune therapies, he said. The study may also have implications for auto-immune diseases such as multiple sclerosis, type 1 diabetes or coeliac disease, when T cells go awry causing the immune system to attack itself. Professor Turner and his research group in the Department of Microbiology, which he heads, are furthering the research using human cells and are finding that many of the results are translating well. First author on the paper was Research Fellow Dr Brendan Russ; Dr Jasmine Li was also a post-doctoral researcher on the project while bioinformatician Dr Moshe Olshansky processed the large amounts of data from the gene sequencing. This research was supported by the Australian National Health and Medical Research Council and the Australian Research Council.